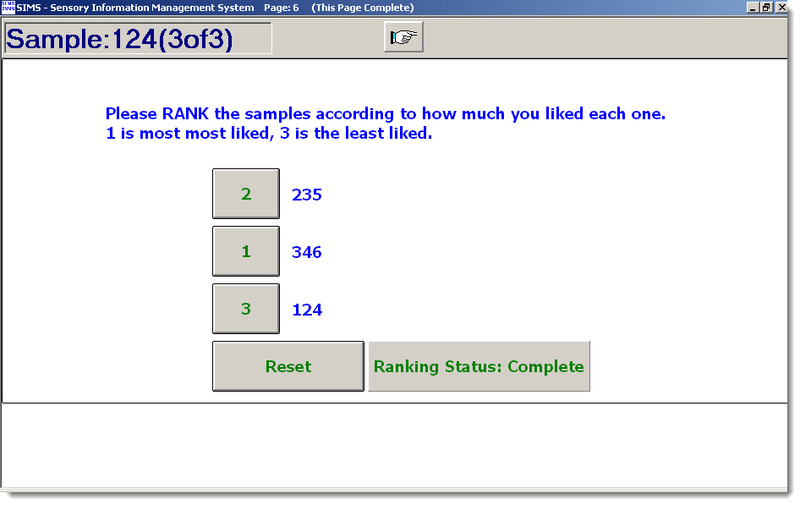 Each raw data excel row shows all responses for one individual sample. 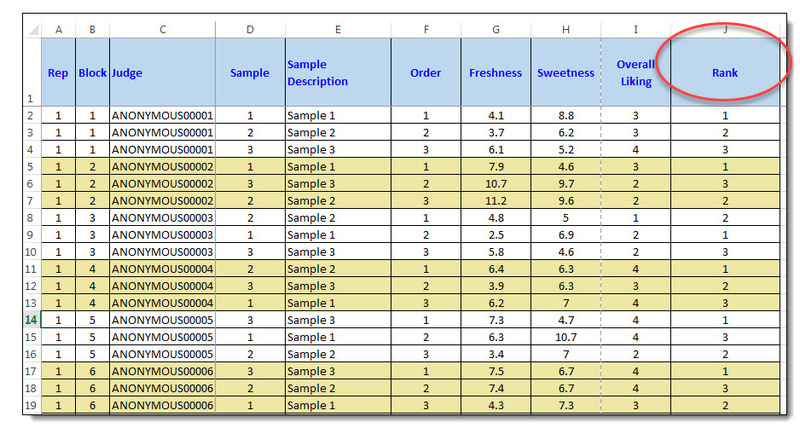 The Rank column is the rank for the Sample shown in Excel column D & E.
Review the SIMS Frequency reports to see how many times (frequency) each sample scored 1st, 2nd, 3rd, and so forth, and the MEAN scores. Here how to get the % and/or # of people who preferred sample 1, 2, 3, etc. Rank column shows the actual rank value as shown. Each raw data excel row shows all responses for one individual sample. The Rank column is the rank for the Sample shown in Excel column D & E.
The Test Design, and Data collected, should naturally be perfectly BALANCED per Ranking, aka Balanced Complete Block. The Friedman statistic is typically applicable for complete block experimental designs only. Alternate Reference:  Sensory Discrimination Tests and Measurements, Jian Bi, 5.2.1, pg 82. This Formula returns same value result for T as shown above. The Test Design, and Data set collected, should usually be BALANCED, aka Balanced Incomplete Block (BIB). but applicability is debatable and best stats should be evaluated on a case-by-case basis. Best when high N(the #panelists) and the degree of incomplete blocks is low, ie. 5C4 is good, 20C4 less so. P-Values:  Like Complete Block Tests, Chi-Square Distribution functions are utilized. If n is low, the Skillings and Mack (1981) Table 2 approximations may be utilized. LSD = Fisher's Least Significant Difference.